Do you have one or more missing teeth? Replacing them is crucial. Missing teeth can make chewing and speaking difficult, and it can cause remaining teeth to move out of alignment. What’s more, missing teeth can even cause bone loss and the loss of other teeth. But thankfully, there’s a way to restore what you’re missing with dental implants. 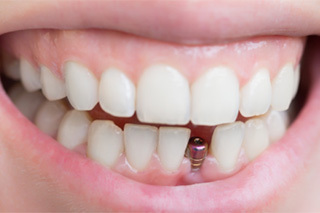 A dental implant using a small metal post made of titanium to secure a new prosthetic. The combination of a prosthetic with an implant post mimics the natural structure of a tooth and its root. This is important, because of the role tooth roots play in not only securing teeth but also strengthening the jaw. Implants are an incredibly versatile service. They can be paired with a single crown, a bridge, a partial, or a full denture. No matter how many teeth you need to replace, dental implants can help. 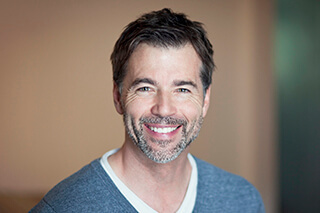 Do you want to know if dental implants are right for you? Dr. Tillman would be happy to answer that question for you. At a special consultation appointment, he will assess your health, plus the strength of your jaw, to determine exactly what your best treatment option is. If dental implants are the best option for you, we would be happy to discuss your next steps. Treatment with dental implants is completed in two phases. In the first phase, one or more implant posts will be inserted into your jaw. In the second, which only occurs after your jaw has healed, your new prosthetic will be attached, completing your procedure and restoring your health. Dental implants cost more than other types of tooth replacement. There—we said it. But you cannot simply consider the upfront cost. Amortize the cost of an implant over the many years that you have one, which could be for your entire life, and you may just find that these replacements cost less than others. Partials and dentures occasionally need repair and will eventually need to be replaced. These services add up. Thus, dental implants can be very cost-effective.